Martin Schneider (CRMOutsiders) asked this question – Who Owns Social Data? to a panel at the recent SugarCRM conference, held in San Francisco. Sameer Patel, Esteban Kolsky, Jeremiah Owyang and Diogo Rebelo participated in the panel. Since I was in the room, and organized the track, I threw my $.02 in every once in a while (sorry guys). I followed up via email with Sameer and Esteban, and Jeremiah started a whole thread on data and data ownership on the scrm-pioneers Google group. Please keep in mind that I am looking at this question from the company perspective. I know, how very non-social of me and of course Inside-out. In fairness, companies knowing more about people is a good thing, it can aid in more Social CRM types of activities – I understand your privacy concerns, but let’s not go there just yet. The idea I threw out at the conference was simple “Data owned and Data borrowed”. My meaning was/is simplistic, there is some data that will be managed by the company and then there is data managed by someone else (maybe even me). An example of this is the data that a company has because they asked me for it, core demographic (Email, Address, Phone) and then there is the data that they try to find out about me and my company by taking the core demographic data and looking elsewhere (Hoovers, LinkedIn, Twitter, Facebook, Radian6, Gist). Esteban, in typical fashion, started with “I like your taxonomy, but…” Esteban suggested a slightly simpler approach “Created, Stored, Used”, which is a little simpler, as borrowed and displayed are combined. While the majority of the world seems to enjoying bickering (me too sometimes) on minute details, I am perfectly fine with the suggestion (no “but”). Esteban’s most valuable point to me is the following:”..the true value is not in the creation or storage, is in the proper use.” I like that, as long as the use within the terms specified by the owner. Going into data ownership is beyond this post, (and I will quickly get in over my head), as the Terms of Service seems to be a little different for various data sources. If the system is looked at from a purely operational perspective; meaning people trying to make decisions based on atomic changes (versus masses of data) the approach needs to be one way. If you would actually like to understand trends and behaviors (you know, Analytics) then you would actually need a copy of the data I referred to as borrowed. In reading back through my own words, I suppose the question is not really “Who Owns Social Data?” (As I believe Sameer said on the panel “Who cares?”) it is more important to understand what you would like to do with it – what you need, when you need it. In the end, I might suggest to keep the more detailed taxonomy, and you can feel free to condense or expand as necessary. I believe that for their described uses of data both Esteban and Sameer are correct. I also know that Sameer does not just focus on Analysis, nor does Esteban just focus on operational use – my point is specifying the use upfront is important.What are your thoughts? Is the taxonomy too simple, too complex – or just plain old unnecessary? I would like to thank them each of them for their time. Each has their own blog, and you should pay attention to them there! Esteban Kolsky is a customer strategist. He advises organizations of all sizes how to approach their customer initiatives to succeed. Esteban believes strongly in analyzing data from carefully thought out research. Esteban also likes to tackle the sticky issues that the rest of us avoid – calling a spade a spade if you will. Sameer Patel helps leading organizations accelerate employee, customer and partner performance via the strategic use of social and collaborative approaches and technology. He shares his thoughts on this, as well as the software vendor landscape and on occasion, a healthy rant or two about unrelated stuff that’s on my mind. 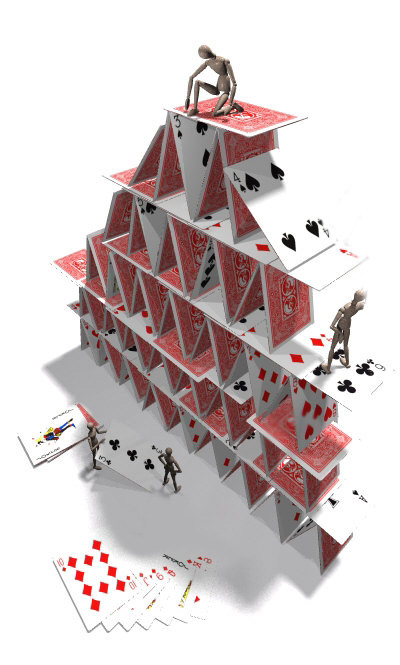 Is Social CRM a house of cards? I am not simply going for shock value, I am asking a tough question where one of the possible answers is ‘yes’, and that scares me a bit. If we choose to ignore 20 years of knowledge, experience and best implementation practices, then we are setting ourselves to repeat the same mistakes that gave CRM a bad name. This pushes the answer towards ‘yes’, how can we push it towards ‘no’? Is this post an about face for me personally? No, I do not think so, call it a prequel – something I knew, felt and should have said a long time ago. There are some great ideas, even some really awesome technology components that can make up the pieces of a solid Social CRM strategy. However, at the core, there needs to be a well architected, flexible CRM application that will serve as the foundation for the Social CRM strategy. There are certain things ‘the basic blocking and tackling’ if you will of CRM which cannot be ignored. Without a proper foundation, adding more layers and more cards simply adds to the instability. Recent posts (and some not so recent) are well suited to help me describe my concerns. (They are listed at the bottom, to avoid hyperlink hypnosis). If we first look at Paul’s definition of CRM and then Social CRM it should be clear that Social CRM is an extension – by process, culture and/or technology– of CRM. The change was and is required due to the changing needs of the customer. Since the customer changed, the companies also need to change. But, If you change the focus (who and how), it is very easy to forget the battle scars of CRM 1.0 implementations. As Esteban points out in his recent post, the ownership of the concepts of CRM have moved from one part of the organization to another. Because of this change, the institutional knowledge regarding what it means to build a holistic customer strategy may not be all there. Some is lost, or worse, some is being ignored. Again, I am not talking about definitions, I am talking about practice. Is technology a part of the extension? Yes, it probably is, but it will not work if you do not make people and process changes first (think attitude!). If you use technology as a part of your CRM strategy, then you will likely need technology to extend it to a Social CRM strategy. If you do not have a well organized technology strategy for CRM (meaning it is not simply email and spreadsheets) then adding new technology for Social CRM will NOT be effective. It is dynamic because where and how the conversations happen will change. Brian and others speak a bit about ‘changes in centricity’ – I am summarizing, but the sentiment should not be lost. Customer centric versus management centric; Conversation centric versus Process Centric – Centricity, Focus whatever the best name for it is, needs to evolve and meet your business need – what do your customers want. Regardless of what you call it, both sets of data are still important. Can anyone tell me that what I purchased, when I purchased it and my buying patterns have stopped being important? I know Brian was not going there, I am illustrating a point. Please read his post, it is important. Jacob posted the Social CRM process, is it right I am not sure, actually it is probably wrong – hold on, I am not coming down on anyone! I applaud Jacob because anyone should be able to take his diagram and use it as a baseline model (not a best practice) and move the arrows, fill-in the boxes and make it work for your business. People, Process and all that… Jacob is spot on for highlighting process – look at what you have, and where ‘Social’ should fit into the company. Do not force Social in, just because it is cool. This list is not just a WordPress – blogs you might also like to read! These specific people, posts and comments on the posts influenced my own thoughts – what are yours? CRM takes on many faces, and encompasses a lot of different technologies. We would be ridiculously arrogant, and wrong, to assume that our solution was the only way to manage a CRM initiative. When at the optimal stage, CRM systems are hitting on all cylinders by not being one piece of technology but rather many tools working together to support the people and processes that make your human interactions unique. In that vein, a major trend we are seeing among users and in general is the need for more fluid tools to support the highly versatile forms of collaboration going on around sales, marketing and supporting customers. Gone are the days of information silos – where a sales rep or manager reigns supreme over most of the interaction data surrounding an account; nor is it sufficient to only arm support agents with the data and tools to solve customer issues. Aaron, your SugarCon session is around “collaborative CRM.” Can you give a quick definition of collaborative CRM vs. traditional CRM? Terms like “social CRM” and “Collaborative CRM” are being used a lot these days and it seems as if the products in this space grown daily. MindTouch has a very specific view of what Collaborative CRM needs to be. I can boil down the biggest difference in two words: Information Asymmetry. Let’s take a common CRM use case – managing a specific transaction. This transaction has a lead account manager, perhaps a sales rep who helped qualify the deal, a pre-sales engineer, and possibly a services manager engaged. All of these team members have various contact points inside the prospect. These multiple contact points can quickly create an information asymmetry situation where data that might be held in the form of emails, documents, phone call notes, etc., isn’t as accessible as it could be, and that could be to the detriment of the transaction. Our vision of Collaborative CRM is to create an information advantage for all of the team members involved. I’m excited to share this vision at SugarCon. So, where exactly does “Enterprise 2.0” meet with CRM? Are they two separate things? To realize the ‘information advantage’ I mentioned before, the CRM system must embody Enterprise 2.0-type attributes – that is to say, to openly and easily interface with other information-rich systems, to support the collaboration amongst team members, including those who wouldn’t traditionally interact with a CRM system. A lot of CRM systems are great with structured data, but how can users better leverage unstructured data like emails and PDFs etc. in their CRM initiative? Great question. Unstructured data cannot be overlooked, as they are vital pieces of the activity stream. All too often, aggregating the data in those activity streams is overlooked, this is especially true for purely ‘social crm’ solutions. These emails and PDF’s are typically relegated to your desktop or your inbox. Emailing these documents back and forth has to be the single most inefficient way to share documents, and everyone does it. MindTouch ensures these types of data points are not overlooked, by integrating them directly into the activity stream, making them collaborative – easy to find, share and act upon. How does it benefit a user organization to have open collaboration tools versus proprietary alternatives? No two organizations are the same. You can definitely provide customers with purpose-built and feature rich solutions – but there will always be the desire on the customer side to perform their own customization. Most often, this occurs with a custom application they’ve developed in-house. With rigid, proprietary offerings, this might not even be possible. Finally, how are you seeing “the cloud” change the way businesses collaborate with each other, and their customers? MindTouch is web-based, so we’ve always had the benefit of providing our customers a solution that could cross boundaries – enabling internal teams to collaborate with partners, vendors and customers. The big benefit we see in the cloud is that it becomes a great equalizer. No matter how easy you make your product to download, install and deploy, there will always be that slice of the market that doesn’t have the IT wherewithal to make it a reality. With the cloud, any size organization can simply sign up and be up and running in minutes. This means a company of any size can now leverage the same enterprise collaboration solution that companies like Mozilla, RightScale, Intel and the WashingtonPost rely on. At first I was going to state the title in the form of a question, but this is not Jeopardy, and I wanted to make a point. The point is simple really, the path to success in Social Business is through Social CRM, said with conviction, not hesitation. This is not going to be a blog about definitions, though some may show up later or in the embedded presentation. While I have decided to move past the definitions, others may not be ready – fair enough, catch-up when you can. My approach is to put forth a convincing argument by using the characteristics and attributes that make up the Social Customer, Social CRM and a Social Business; not trying to redefine them. My own struggle has been to place these concepts in the proper context, individually. To try to talk about any of these topics, without bringing up the other two is just hard and many times it just does not make sense. My operating theory is, ‘if I am having trouble a whole lot of other people are as well’. If you are an IT purist, it is like trying to talk about just Cost, just Schedule or or just Scope (not to mention Quality) without talking about the others – they are related, strongly – interdependent. While technology certainly plays a role here, maybe it is even to blame, this is not about technology, rather what has started because of it. While the conversation would not be happening if it where not for the rapid change in behaviors caused by technology, it is about the change in culture and the change in behaviors of the customer (iPhone, Facebook, LinkedIn, FourSquare, YouTube, Blogs). Because they are ALL talking to eachother! By the way, whether you are Business to Business or Business to Consumer, it does not really matter. Yes, there are some differences, but there are more similarities than differences. We are all humans, and emotions play a big part in business too, sorry, it just is! I have stated on many occasions that I use blogging to formulate my own thoughts on a particular topic. In this case, it was the creation of a presentation – or the template for a set of presentations which I need to deliver, beginning next week. I wanted to share the presentation, so that I am able to get feedback and begin a conversation on how I can refine the delivery. What would a presentation be in this space, if it is not actually Social and Interactive. The presentation will not remain static, nor should it. It is also anyone’s to use, if you think it can help. The presentation is not an attempt to be a strategy either, that is yours to create. My thought process was to break it down into small pieces, then attempt to put it all back together. The baseline of understanding is not a definition of a system, but the characteristics of the system. The end of the presentation is not yet complete, but I wanted to put this out there so people were able to review. Please let me know your thoughts – Selecting the “Wide Screen” option on the lower right worked best for me. If the embed feature did not work, there is a link below. I was able to integrate the Prezi on wordpress using vodpod, if the embedding did not work right, just do it the old fashioned way Social Business through Social CRM on Prezi. Connecting the dots, first step Creating Buyers! A purist could say I am avoiding the word ‘Sales’, not really, just choosing a phrase I deem more appropriate for a Social Business. I strongly believe that the future of business will be more about the creation of buyers than what we think of today as the selling of product. That said, with all of the talk about ROI, KPI and value, we still struggle to convince our own bosses that this is will happen, because in the end, the measurement is about money changing hands – but that to will also change in subtle ways, as we move forward. My final personal objective is to highlight and expand the Altimeter Group Use Cases. Why, because they represent a great way to get past the ‘Buzz and Hype’. Also, an important aspect, business executives, marketers, PR folks and CRMers can understand them. No, the Use Cases are not perfect, they are not meant to be, I see them as a foundation. Is this perfect? – not even close. Are there other Use Cases which should be enabled here, probably. Should there be a series of conditions, dependencies and ‘what-ifs’. That depends – No blog, book or article will be able to define a strategy, your strategy. You know your business. You know your customer or do you?